A 2.8-million-year-old jawbone fossil with five intact teeth unearthed in an Ethiopian desert is pushing back the dawn of humankind by about half a million years. Scientists said on Wednesday the fossil represents the oldest known representative of the human genus Homo and appears to be a previously unknown species from the human lineage’s earliest phases. Our species, Homo sapiens, appeared only 200,000 years ago, following a procession of others in the same genus. Until now, the oldest known remains from the human genus were about 2.3 to 2.4 million years old and from the species Homo habilis. “Although it is probably a new species, we are awaiting more material before definitively naming a new species,” said University of Nevada, Las Vegas anthropologist Brian Villmoare, who helped lead the research published in the journal Science. 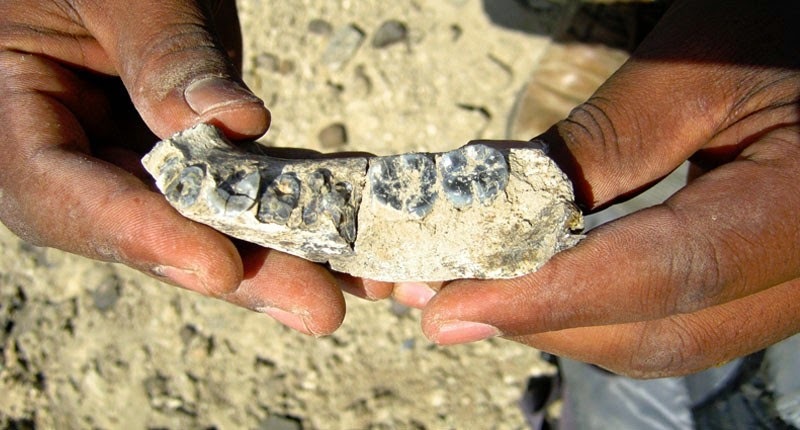 The jawbone was found in 2013 in northeastern Ethiopia’s Afar region about 40 miles (64 km) from where the remains of “Lucy,” one of the most famous fossils of a human ancestor, were discovered in 1974. Lucy’s species, Australopithecus afarensis, immediately preceded the Homo genus The anatomy of the new fossil, encompassing the left side of the lower jaw, suggests a close relationship with later Homo species. It boasted features including tooth shape and jaw proportions that separate early Homo lineage species from the more apelike Australopithecus. But its sloping chin still has hints of Lucy. “At 2.8 million years ago, this places the evolution of our genus very close to 3.0 million years ago, which is when we last see Lucy’s species,” Villmoare said. The Homo genus, especially after 2 million years ago, developed larger brains and tool use and began eating meat. A separate study in the journal Nature provided a fresh analysis of a Homo habilis lower jaw from 1.8 million years ago, showing it was unexpectedly primitive and resembled the much older newly discovered jawbone.